...is a Steds tradition that continues. What is Kilting? 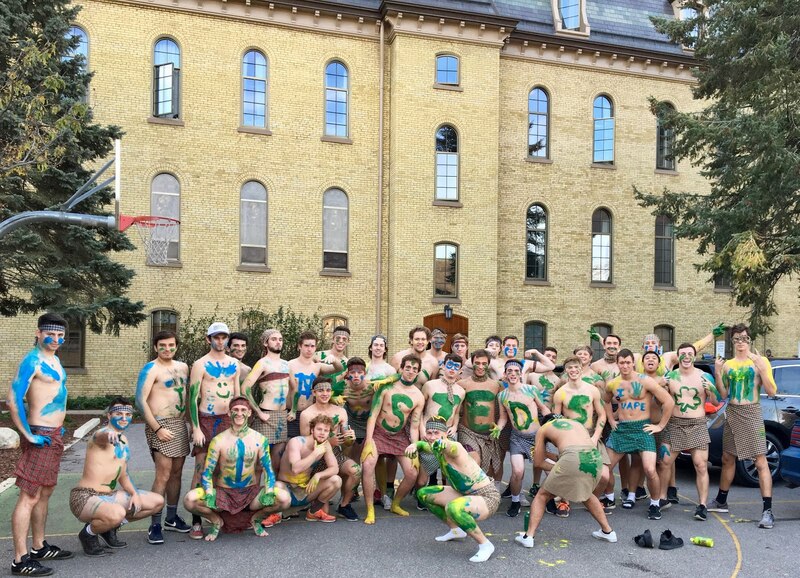 Kilting is something that St. Ed's has done for over a decade (so it must be a tradition) where the Gentlemen fashion kilts and don body paint for the football pep rally. This year, President Trzaska set kilting for the Wake Forest game weekend, and thank God that he did because it's going to be terribly cold for Navy! Without any doubt, the sight of the Gentlemen in their kilts, coupled with their antics and irrational exuberance, lifted the spirits of many at the pep rally. Okay, they were the pep rally! freshman Patrick Magner said, "I was surprised to find that not only does paint keep you aerodynamic, and, shockingly, warm, but it's also edible." Fellow freshman, Peter Haley, added, "While kilting was overall an amazing experience, I would like to file an official complaint against Steve Max- the leader of the stadium-wide 'Simon Says' game. I've never before lost in 'Simon Says', so there must have been a conspiracy to prevent me from winning. I'll be back next year with a vengeance!" Frank Khoi, a freshman and Californian, chirped in and shared, "Kilting? More like Floating 2.0 . . . with much more cardio." Not to be left out, freshman, Jack Olmanson said, "There are only two options in life: kilt, or be kilted. I chose to kilt, and that made all the difference."